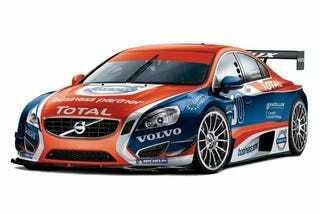 We were just saying something about needing the Focus RS500, we think — can't really remember because this 410HP, mid-engined, rear-wheel-driver Volvo S60 headed for the Belgian Touring Car Series wiped out our memory. Imagine if it where a wagon. Volvo. S60. Race car. Mid-engine. Rear wheel drive. 410 HP, 304 lb-ft of torque 3.5-liter V6. Tube frame chassis. Six-speed sequential transmission. Silhouette S1 racing body.